The Derby Silver Company began operation in 1873. The company became part of the International Silver Company in 1898. Derby Silver Company. (1872-1900). Urn, with shells pattern. Embossed silver. (Cat. no. 2008.0008.0044. Viewed 10 July 2018. G02472-74). Photos - Colorado Springs Pioneers Museum, CO.
Derby Silver Company. (1873-98). Hairbrush. Accession no. 1960.82.85. Viewed 26 July 2018. C00156). 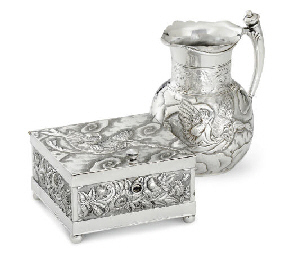 Click the following link to see the parallel webpage - Derby Silver Company design catalogues and historical information. Photo - Wolfsonian-FIU, Miami Beach, FL. Derby Silver Company. (1880-90). Cake basket. Silver or silver plate. (Accession no. 1986.248. Viewed 11 August 2018. L00001). Derby Silver Company. (1882 or before). Derby Silver Cup trophy (covered pitcher form) for the New Haven Yacht Club (Connecticut) regatta. (Viewed 15 October 2018. B01076-80). Offline - New Haven Yacht Club (CT). See Design Meriden - Derby Silver Company design catalogues and historical information resource page, for 1880s news articles mentioning the Cup. Derby Silver Co. (1880-98). Round plate. Silver plate. (Item no. A-61.054. Viewed 2 August 2018. H00164). Derby Silver Company. (c. 1887). Pitcher. Silver plate. (Accession no. 2016.3.6. Viewed 18 April 2018. G02060). Photo - Munson-Williams-Proctor Art Institute, Utica, New York. Derby Silver Company. (1890-1930). Dresser mirror. (Cat. ID No. 1981.118.2004. Viewed 26 July 2018. C00157-58). Derby Silver Company. (1895). Trophy. Silver plate. (Artifact no. 1987.1480.001. Viewed 29 December 2018. J00239). Derby Silver Company. (c. 1900). Letter rack. Silver or silver plate. (Accession no. 1971.895. Viewed 11 August 2018. L00002). Presumably Derby Silver Company / International Silver Company. (c. 1900). Loving cup. Silver plate. (Cat. no. 1978.037.009. Viewed 10 July 2018. G02442). Photo - Jewish Museum of Maryland, Baltimore. Derby Silver Company / (ISC). (1900-17). Six-piece caster set. Silver plate. (Cat. no. S6026. Viewed 18 July 2018. G02959-61). Photo - Washington County Historical Society, Hagerstown, Maryland. Derby Silver Co. / ISC. (c. 1905). Hairbrush, Art Nouveau. Silver or silver plate. (ID no. NM.0257104A-C. Viewed 24 July 2018. C00106). Photo - Nordiska museet, Stockholm. Victor Silver Company / Derby Silver Company / (ISC). (1909). Loving cup, trophy. Silver plate. (Cat. no. F10.0206. Viewed 6 July 2018. G02345-47). Photo - Historic Richmond Town, Staten Island, NY. 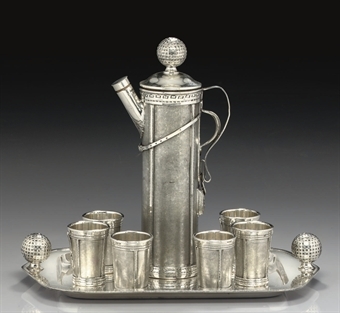 Derby Silver Company / International Silver Co. (c. 1915-30). Pitcher. Silver plate. (Viewed 2 August 2018. H00162). Derby Silver Company / International Silver Company. (c. 1930). Trophy. Sterling silver. (Cat. no. 0000-073-001, Viewed 17 July 2018. G02902). Derby Silver Co. / International Silver Company. (c. 1931). Trophy. Silver plate. (Cat. no. x2100/5. Viewed 23 August 2018. L00717-18). Photo - Arizona Historical Society, Tucson. Derby Silver Co. / International Silver Company. (c. 1932). Trophy. Pewter. (Cat. no. x2100/6. Viewed 23 August 2018. L00719-20). Derby Silver Company. (undated). Powder box. Silver or silver plate. Object ID. 72.28.1.A-B. Viewed 30 July 2018. H00060-63). Victor Silver Company / Derby Silver Company / International Silver Co. (after 1898). Cup. Silver or silver plate. (Item no. A-117.003. Viewed 2 August 2018. H00163). Derby Silver Company. (undated). Napkin ring. Silver plate. (Object no. 1990.20.172. Viewed 8 July 2018. G02387). Rutherford B. Hayes Presidential Library & Museums, Fremont, OH. Victor Silver Co. / Derby Silver Co. (undated). Cocktail fork. Silver plate. (Cat. ID no. 2018.22.5. Viewed 31 July 2018. H00121). Derby Silver Company. (undated). Tea set: teapot, creamer, sugar bowl. Silver or silver plate. (Cat. nos. 63-129(-30, 31). Viewed 10 July 2018. G02475-77). Colorado Springs Pioneers Museum, CO: teapot; creamer; sugar bowl. Derby Silver Company. (undated). Syrup jug. Silver or silver plate. (Cat. no. 63-132. Viewed 10 July 2018. G02478). Derby Silver Co. (1873-98). Dinner fork. Silver or silver plate. (Object ID. no. H.A.3.4.2.32. Viewed 30 July 2018. H00064-65). Derby Silver Company. (1875-98). Dinner fork, Bouquet pattern. Silver or silver plate. (Accession no. 1971.1864. Viewed 11 August 2018. L00003). Photos - New York Historical Society, New York. Derby Silver Company. (c. 1885). Butter knife. (Cat. no. M1968.1.7. Viewed 9 July 2018. G02420-21). Derby Silver Company. (19th century). Four fruit knives. Silver or silver plate. [Accession nos. 1971.1451.1(-.4). Viewed 11 August 2018. L00004-07]. Photos - Historic New England organization, Boston: fruit knife 1, 2, 3, 4. Victor Silver Co. / Derby Silver Co. / International Silver Company. (1922-35). Four egg spoons, Windsor pattern, for Fred Harvey restaurants. [Accession nos. 2008.49.221(-.224). Viewed 3 August 2018. H00258-61]. Kansas Historical Society, Topeka: egg spoon 1, 2, 3, 4. Victor Silver Company / International Silver Company. (1925-35). Eight dinner forks, three teaspoons, two tablespoons, Savoy pattern, Fred Harvey restaurants. [Accession nos. 2008.49.195(-.207). Viewed 12 August 2018. L00268-80]. Kansas Historical Society, Topeka: dinner fork 1, 2, 3, 4, 5, 6, 7, 8; teaspoon 1, 2, 3; tablespoon 1, 2. Photo - Sverresborg Trøndelag Folkemuseum, Trondheim, Norway. Victor Silver Co. / Derby Silver Co. / International Silver Company. (undated). Teaspoon, Windsor pattern, Missouri Pacific Railroad. (Accession no. 2013.47.78. Viewed 5 August 2018. J00037). Photo - Bonhams Los Angeles - Sunset Estate Auction (30-31 AUG 2009). Photo - Christie’s New York - Important American silver (17 JAN 2008). Photo - Christie’s New York - The House Sale (20-21 DEC 2006). Photo - Bonhams San Francisco - SOMA estate auction (18 NOV 2007). Photo - Christie’s London - 20th century decorative arts (29 OCT 2008). Photo - Christie’s London - Christie’s Interiors (18 MAR 2008). Photo - Bonhams Brookline (MA) - Golf clubs and golf memorabilia featuring the Larry Boone Collection (5 MAY 2006). Photo - Christie’s London - Christie’s Interiors (6 APR 2016). Photo - Sotheby’s New York - 20th century design (27 MAR 2009). Photo - Sotheby’s New York - 20th century works of art including contemporary works of art (7 JUN 2002). Photo - Bonhams San Francisco - SOMA estate auction (18-19 SEP 2011). Photo - Bonhams Los Angeles - Sunset Estate Auction (19 MAR 2006). Photo - Bonhams San Francisco - SOMA estate auction (22 FEB 2009). Photo - Bonhams San Francisco - SOMA Estate Auction (22 MAY 2011). Photo - Bonhams London - London to Brighton veteran car run (3 NOV 2006). Photo - Bonhams San Francisco - SOMA estate auction (19 NOV 2006). c. September 1874. California State Fair, presumably Sacramento. Online - exhibition catalogue - Courtesy American Craft Council, Minneapolis, MN. 23 October 1986 - 11 January 1987. In pursuit of beauty: Americans and the Aesthetic Movement at the Metropolitan Museum of Art, New York. (Viewed 3 July 2016. A00522; A00721; A00976-77; A00981.) ["Derby Silver Company", mentions (pp. 275-77, 419)]. Online - exhibition catalogue - Metropolitan Museum of Art, New York. Book / catalogue accompanying exhibition - Yale University library . See worldcat.org for more locations. On Derby Silver - 1: designs in collections, etc. | 2: design catalogues, etc.